Immigration Lawyer the Bronx: Do You Need a Provisional Waiver? Should You Apply for a Provisional Immigration Waiver? If you’ve been in the United States as an undocumented immigrant and are now trying to apply for your green card, you are going to face some big obstacles. One of the biggest obstacles that you’ll face is the fact that you will not be eligible for an Adjustment of Status. This only happens when you are already in the United States on a current, valid visa and want to change your status to that of an immigration status. If you aren’t already on a visa, then you’ll need to exit the United States and go through Consular Processing. Unfortunately, if you are in the United States illegally, then you could end up being banned from returning to the United States later on, potentially for years to come. Part of the process of applying for an immigration visa through Consular Processing is going for your visa interview at the U.S. Consulate in your home country. A provisional waiver essentially asks permission to return to the United States after your visa interview, despite the fact that you were in the country illegally. If the U.S. 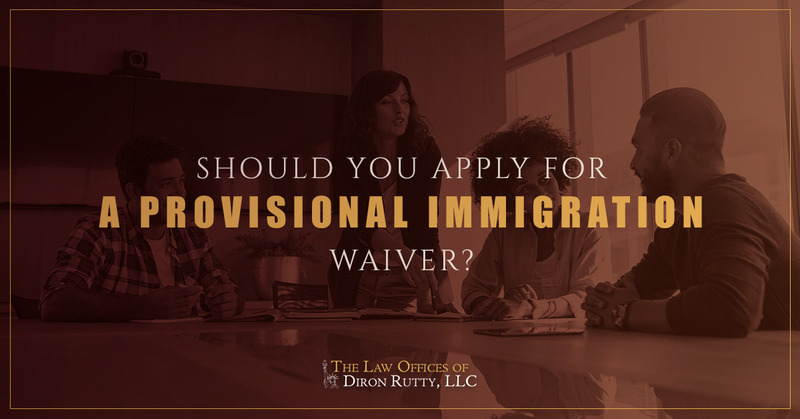 Citizenship and Immigration Service (USCIS) grants the waiver, then you can leave the country for your interview knowing that you should be able to return later on. If they say no, you will at least have an answer while you are still in the country and can make some preparations for your departure. In some cases, you can also appeal the decision. Are There Reasons Not to Apply for the Waiver? You’ll need to provide a lot of personal information about yourself and your sponsors (your relatives who are currently residing in the United States) to USCIS. Some applicants are concerned that their information could be turned over to Immigration and Customs Enforcement (ICE). This is unlikely unless you have a criminal history or you pose a threat to national security. However, it’s something to keep in mind and you’ll want to consider your personal history and that of your sponsors before turning over that information. You shouldn’t bother applying if there are grounds for denying your immigration application. For instance, if you’ve been in the United States as an undocumented immigration for more than six months, have a criminal record, or are associated with a group that poses a threat to national security. Remember that part of the application process is proving that leaving the United States will cause undue hardship on the family you’ll be leaving behind, typically a spouse or parent. If you aren’t sure that you can provide enough evidence of extreme hardship, it might not be worth applying. Immigrating to the United States is rarely straightforward or easy in the best of circumstances. When you have been in the United States as an undocumented immigrant, it can make the process much more difficult. Working with an experienced immigration attorney can help you choose the right path towards legal immigration and citizenship. Trying to navigate the system on your own can result in spending more of your time and money as well as causing more stress for yourself and your family. If you would like help with your immigration process, the Law Offices of Diron Rutty, LLC can help. We’re offering free consultations to those seeking immigration help. These consultations are strictly confidential, so you can get the answers that you need without worrying about repercussions on your case. Simply get in touch with our office by giving us a call or sending us a message through our website. A member of our team will get back to you right away to arrange your consultation so you can start to get the answers that you need. We’re looking forward to helping you move forward on the path to citizenship and realizing your dream of living in the United States.